Enhancing the patient experience is an increasingly important differentiator in healthcare today. It’s also a rapidly evolving field, now incorporating design thinking and new technology. Learn more at this summit May 22-24. It’s no secret. The experience patients have with you – and your organization – matters. 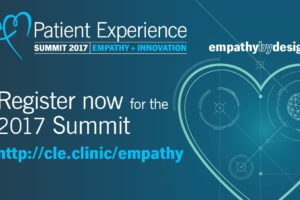 Through its highly regarded Empathy + Innovation Patient Experience Summit, Cleveland Clinic and medical professionals from around the world share their passion and approaches with those who are eager to learn more. Attendees leave with innovative strategies and tactics to enhance patient and caregiver experience, reduce clinician burnout and much more. In the following Q&A, Cleveland Clinic Chief Experience Officer, Adrienne Boissy, MD, MA, shares plans for the fast-approaching summit, the eighth annual. This year’s conference is May 22-24. Q: The Empathy + Innovation Patient Experience Summit is considered the world’s largest independent conference on patient experience. Why should people attend? The summit assembles some of the most respected leaders in patient experience, including patients and clinicians, making their expertise available to about 2,000 conference attendees every year. It’s an opportunity to discuss best practices, acknowledge challenges, network with peers, and hear about innovative solutions. This year, speakers will be discussing the intersection of design thinking and healthcare, high reliability and its relationship to patient experience, engagement and co-creation, consumerism, technology that drives empathy and end-of-life perspectives. We believe that patient experience is inherently connected to high-reliability organizations that are focused on patient safety initiatives, quality and excellence in communication. So the conference offers an exceptional opportunity to network with like-minded people and also those with perspectives beyond healthcare who we might learn from. Maybe you are trying to drive quality, address burnout or are looking for best practices that can be sustained. This is your summit. Q: Give us some highlights from the program. We have a fantastic lineup of speakers. Back-to-back on our agenda are two powerful topics that I don’t think will be on the same stage anywhere else. The first is a plenary session on clinician burnout facilitated by Cleveland Clinic Chief Executive Officer Toby Cosgrove, MD, with Drs. Tait Shanafelt, Professor of Medicine and Medical Education at Mayo Clinic, and Christine Sinsky, Vice President of Professional Satisfaction at the American Medical Association. We’ve talked a lot about why burnout exists, so this exceptional panel will focus on what we can do about it. We are also extremely excited to welcome Lucy Kalanithi, MD, Clinical Assistant Professor of Medicine at Stanford University School of Medicine. Her late husband, Paul Kalanithi, wrote the best-seller, “When Breath Becomes Air,” about his experience facing mortality as a 36-year-old neurosurgeon, husband, father and patient. Also on the plenary stage, we’ll introduce big ideas about design thinking and empathy and hear from organizations that have implemented related strategies. In response to feedback, we are offering more tactics and tools and more workshops this year. Participants can get their hands dirty, creating their own journey maps to answer questions such as, “How do I get started with access?” or “How can I fix delays?” or “How do I create a persona?” They’ll get fresh ideas and new perspectives to help solve old problems. Lastly, we just learned we will world premiere two short films on empathy from award-winning film producers in collaboration with CBS. Q: How do people find out more? This summit is not just about the patient experience, it’s about the clinical and caregiver experience too. It’s the human experience. Cleveland Clinic was the first major academic medical center to make patient experience a strategic goal and to appoint a Chief Experience Officer, and one of the first to establish an Office of Patient Experience.